Here at Mackerel, we are extremely grateful for all of our users and their various activity regarding the Mackerel service. Thanks to all of you and the positive feedback that’s been spread around, the word “Mackerel” can be heard on a regular basis over SNS and among the engineering crowd, known as a reliable choice and for its technical capabilities. In order to show our gratitude and give back, we’ve set up a new program called Mackerel Ambassadors! As a perk, for those certified as an Ambassador, we now offer a special plan. With the Ambassador Plan, all features, including those only available with a paid plan as well as new features added in the future, can all be used free of charge. With this, we hope to receive even more honest feedback, so as to better understand the perspective of Mackerel users and their expectations. In addition, all feedback received will be used as a reference for future development and service operation. The Mackerel team will contact you if you have been certified as an ambassador. Look forward to hearing from us! The Mackerel Ambassador Selection Committee will reach out to those who have been recognized to have utilized Mackerel in a profound way. They will directly contact users via email, SNS direct message, etc. 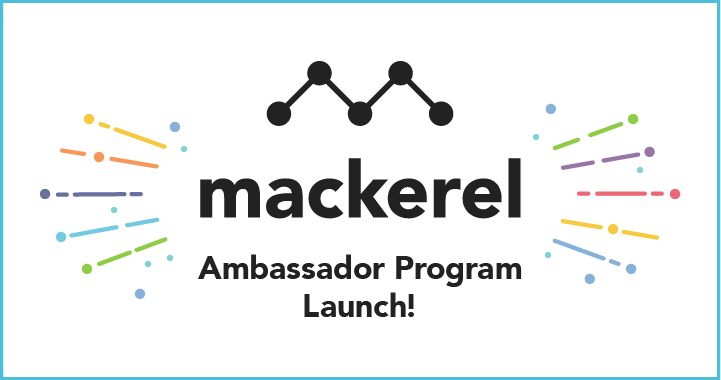 In the beginning, Ambassadors will be appointed through individual recommendations from the Mackerel team, but as the program grows, selections will be made based on the review of submitted applications. The criteria for the process will not be made public. We are asking for Mackerel Ambassadors to submit a blog entry detailing their comments, impressions, or requests regarding a Mackerel feature that they put to use with the Ambassador Plan. These are just some examples, so please feel free to write in more detail about whatever interests you. When we receive a blog entry, we’ll share the blog URL from Mackerel's official account and from individual Mackerel team member accounts etc. Depending on the content of the article, we may even share it on Mackerel's official blog. Regarding participation in the program, we will contact those who have accepted an ambassador position individually.